We Need To Get Off Plastics! As you may know, the federal government has asked for your opinion on how to deal with our mammoth plastic waste problem. We need to see a commitment to real action and leadership if we are serious about tackling the #ProblemWithPlastics. Earlier this year, as part of a national coalition of groups, Sierra Club Canada Foundation called for Canada to get to zero plastic waste by 2025. We are very far from this goal today, as the creation of single-use plastic (AKA garbage) skyrockets and with Canadians recycling less than 11% of the plastic waste they generate. Industry continues to develop disposable plastic products with no requirement that they are responsible for dealing with the resulting waste. And plastics in our oceans and waterways are hurting wildlife, with thousands of seabirds and marine mammals dying every year, chocking on plastic. Small pieces of plastic - called microplastics – are peppering our shorelines and ending up in our food chain. Please add your voice here to show you are willing to eliminate plastic waste by 2025, and that Canada should show leadership on the #ProblemWithPlastics. 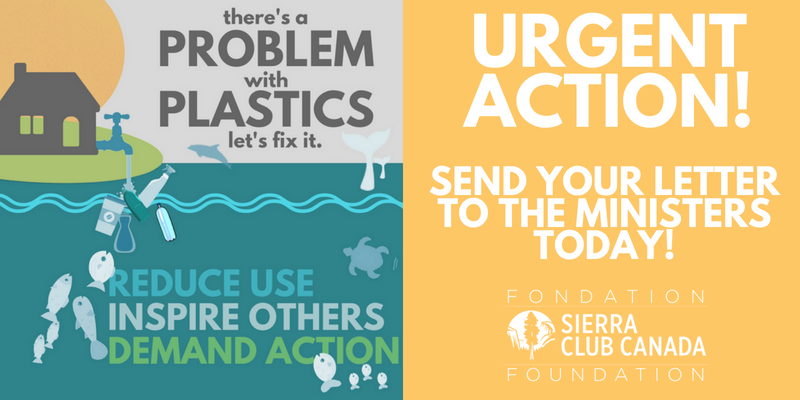 After you sign, please use the links below to share with your friends how you have taken action - big or small - to tackle the #ProblemWithPlastics and want Canada to do the same.